"Funny, she said the exact same thing when I started having premonitions in my dreams" Marro chuckled as they reached his home "Welcome to my sweet home" he said as he opened the door "Whipe your paws please" he asked and did the same himself, padding down the hall and opening a set of sliging doors thar lead into the living room. Alc placed the pencil back behind his ear and followed Marro's instructions to wipe his pads. He then proceeded to follow the black wolf, not sure what to expect when they reach the living room. "Nice home.". Alc commented. We will continue the tour, and then we will decide what to do. Snowy told Soren. So he walked them downstairs, flicking the lights on the way down. Here's my basement arcade, which doesn't cost any money, and that room to our right is a home theater. He explained to the group. So what do you guys want to do now? Pool, trampoline? Or arcade, theater? Alc waved to them as they left, feeling slightly surprised. "Knew my name...". He pointed out. The wolf took a seat next to Marro. "Marro probably mentioned my name during his call. I think...". Said his logical mind. "That was Luna and Sola, they're... a loong story... and they aren't mystics... they're just... like I said a long story"
"Will have to ask about them sometime then. Not now, of course, later." "Right. Mirrors. Water. Mystical stuff.". Alc looked skeptically at the mirror. But he complied to do as Marro told him. He placed his fingertips on the water and looked at the mirror. He wasnt sure what to think of, so he thought of today, his sandwich, the other pets, Marro. Alc didn't seem to respond, his eyes were intently concentrated on the mirror as if trying to see what Marro was seeing . His body seemed to tense, his fingers twitched, making a ripple in the water. "Oh, well I don't know what any restaurant here serves. except for the Italian place.". Casper gave a slight sigh and shrugged in initial response. "Wasn't really expecting you'd know." He replied simply. "Given that think seems useless, I'll try walking around a bit to see and if all else fails just fall back on my last resort." The fox muttered with a slight frown and another mild flick of his tail. "Thank you for the concern though." He added as more or less an after thought while standing to start walking, stretching a bit as he got to his feet. Alc nodded and slowly took his hands out of the water. His face was expressionless as he continued to stare at the mirror in front of him. "Yeah. Fine...". The wolf muttered. Looking not very fine. "Sorry about the headache....". Figuring he caused it. "Maybe this wasn't such a good idea...". He thought to himself. Alc looked down at his his hands. His ears twitched once. "So. What now?" 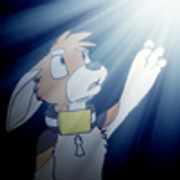 Last edited by WolvenPaw15 on Thu Aug 09, 2012 12:42 am, edited 1 time in total. Overall, Soren didn't care. He'd seen such things before and... he preferred MAME's over actual arcades. Perhaps home theater or pool. Though, the trampoline would be fun too. "Maybe trampoline and pool? If they're close enough we can jump from one into the other," he said, figuring to have some fun. "Well, I don't really care what we do, but the pool sounds nice," Met said, still looking around at the place. "Umm. Ok. I think.". He returned the smile with one of his own. "Just have to ask Dad first." "Already know?". He pointed to his forehead. "Psychic communication?". He asked with a smirk, half joking. Alc facepalmed. "Right.". He stood up. "Sounds like a nice women.". He shifted his weight from foot to foot. "If her personal qualities are like yours.". The wolf added quickly. He meant for it to be a complement, but wasn't sure if he projected it as such. Alc was about to point it out when he realized it might be awkward to do so. "Umm. Gotta phone my Dad.". He said, and quickly left the room before his embarrassment became apparent. "Blah... I need to get better at this social stuff..."
"Thanks!" Marro smiled "Luna! Would you bring me some Sake!" he called Ok big brother!" Sola called instead "Thanks you two!" he replied You're drinking sake this early in the day!?" Jenna called, "This coming from the one who drank some sake for breakfast!" Last edited by WolvenPaw15 on Thu Aug 09, 2012 8:05 pm, edited 1 time in total. Alchemy walked back into the room with a bemused look. One of his ears was up while the other was flattened and he was still holding his phone in his left hand. He waved to the company in the room. "That was... an interesting conversation..."
Alc put his phone away and sat back down on the couch (I'm assuming its a couch.) "Thanks." He said and took the offered bottle and drank from it. The wolf made a funny face as he swallowed. "What kind of drink is this exactly?" Alc asked, closing one eye and trying to see into the container from the top. Alc swirled the drink around in its bottle. "Tasty." He took another sip and looked at the twins. His left ear twitched once. "And yes. I'm curious to know." Alchemy looked at the twins then back at Marro. He wanted to comfort the black wolf but wasn't sure how to proceed. So after analytically running through some possible scenarios he finally decided to tentatively put his hand on Marro's shoulder. "Not a fortune teller, but. Doesn't think that will happen anytime soon.." He said reassuringly (he would have gone into the statistics of it, but he didn't think it was the most suitable time to do so). "You and Jenna. Probably find a good home for them by then too." Alc added with a weak smile. "Your welcome." Alc said in a surprised voice. Being the wolf that he was, he wasn't used to all this feelings and touchy stuff and was caught off guard. Usually when someone tried to hug him (that was mostly his Dad's relatives), he would try to squeeze his way out of the embrace. But after thinking it through he told himself that social conduct dictated he hugged the wolf back, and he did. Alc felt this warm feeling inside him (is that cheesy? cause that sounds cheesy...) and wondered what it was. Oh well, he'd mull over it later. Last edited by Roarin on Fri Aug 10, 2012 8:11 pm, edited 1 time in total. Alchemy grinned and took the wolf's hand. He stood up. "Don't know about that. Technology was always more of a mystery to me"
"Afraid to even ask." Remarked Alc with a smirk as he followed the black wolf. "Technology with supernatural implications." Well that's your two votes what about you two? Snowy asked Ryan, and Joe. Speedy walked out of the bookstore after a long time, noticing that Van had just disappeared. Well, I guess we are done with this shop. She said to Tesla, and Maria. What next? "Well, this guy's looking for a place where they serve hot tea," Maria said pointing to Casper. I could go for a swim. Let's do that. Callie followed after Speedy, I think a nice cup of tea sounds perfect. Ryan had been wandering a little, interested in the area around until he heard Snowy asking what they wanted to do, he didn't really care what they did as it all sounded nice. "Yeah the pool sounds good"
Alright its settled then pool it is. Snowy said then sprinted up the stairs and outside. Once there he took out enough towels for everyone, and took everything that cant get wet out of his collar. Then he waited for everyone else to catch up with him. I already tried to think of a place that has hot tea, but i don't know if anywhere here serves that. Speedy said to her group.